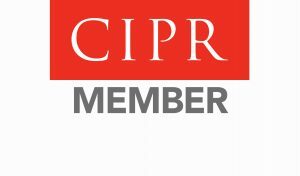 I am really proud and excited to have become a Member of the CIPR (Chartered Institute of Public Relations). I am excited because it’s something I have aspired to since I started working as a freelance PR Consultant back in 2015 and because of the opportunities it offers for continued professional development. And I am proud because, as a Member, I have agreed to the CIPR’s code of conduct and professional standards. This demonstrates to my clients that I am committed to delivering the highest standard of service and that I am constantly striving to build on my skills and improve the performance of my business.